GROW takes a systemic approach to increase the competitiveness of the Liberian rubber sector and improve outcomes for women and men working in the sector. GROW is working with rubber farms to establish a business and investment case for the production of Ribbed Smoked Sheets (RSS), an alternative market channel for smallholder farmers. GROW is also working to lower the cost of supporting and technical services including skilled workforce, viable growth capital, payment systems, and improved inputs, that underpin inclusive rubber industry growth broadly. 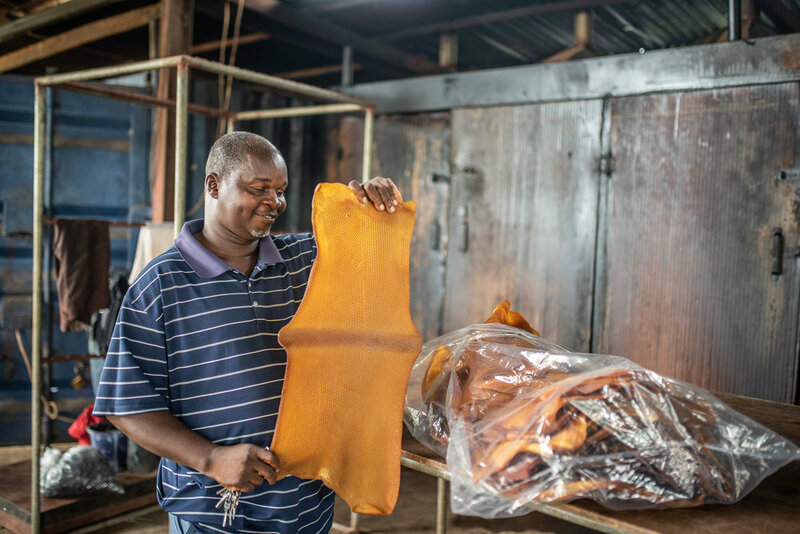 With many Liberian farms struggling to remain profitable in the face of reduced margins, Ribbed Smoked Sheets (RSS) is a processing option that boosts farmers’ profit and creates market opportunities for smaller, independent rubber processors. Consistently, over the last 5 years, RSS has proven to be a lucrative option in Liberia. The Ministries of Education, Agriculture, Youth & Sports have developed a natural rubber production curriculum that is being being adopted by vocational training institutes throughout the country. Training courses are designed in line with the curriculum and cover the skills, capacities, and systems needed for proper farm management in Liberia. GROW is initiating a tapper training program to train Liberian rubber tappers on best practices to extend tree-life.